The first thing to do is to head over to Clarke's site and find the Royal Carrick Bend infograph. Next cut a good length (five feet is what I used) of nylon or paracord. Now here is the part that just about drove me crazy, lay out the first weave of the knot. I found it was really hard to follow the pattern because the rope was sliding all over the place as I was trying to tie it. This is where the duct tape came in to play. Using small pieces of the tape, I taped each section down to the table as I worked so it would stay in place but also allowing for me to pass the next level through. 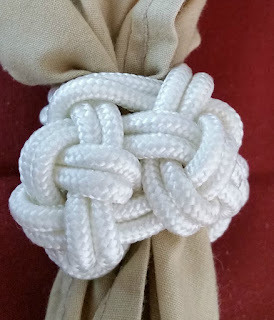 Once you have woven the knot twice, pick it up and put the center around something round like a 3/4 inch dowel (or a hotel shampoo bottle) and begin to tighten the knot. Once it is tight it becomes a really intricate looking knot neckerchief. Cut off the excess cord and fuse it with heat or leave on some tails for frayed ends. On mine, I tied the ends into a carrick bend (not shown) and fused the ends. For those of you who have never heard of Clarke Green, his Scoutmaster blog, or the Scoutmaster podcast, you really need to find him on the net! The Scoutmaster's Oracle, the podcast Commissioner and really nice guy, Clarke shares his thoughts, wit, and wisdom weekly to the folks that follow him world-wide. Always happy to answer a question for Scouter, his answers are spot-on relying on his many years of Scouting experience. On his site he shares his wisdom and thoughts on Scoutmastership, gear reviews, highlights some of the best books on Scouting, program ideas, and information on high adventure areas.